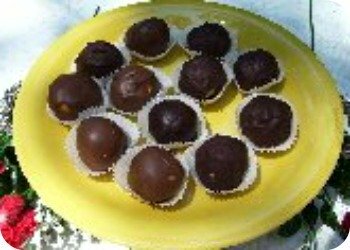 Old fashioned homemade Candy Recipes include chocolate covered candies, Peanut Butter Balls and Coconut Pecan Balls and Peppermint patties. No cooking required. 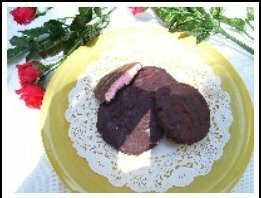 I first made this basic recipe in 1966, following a recipe in a popular candy making cookbook. I adapted the original recipe to provide more creaminess and less sweetness. I added a semi-sweet Chocolate Dipping Recipe coating that the recipe did not include, (including how to temper the chocolate). I then added a light corn syrup, which is a humectant to keep your candies moist. In a large mixing bowl, stir together evaporated milk, corn syrup, and vanilla. Add 2 1/2 lbs. of the powdered sugar, 1 cup at a time, stirring after each addition until the lumps are dissolved. (The lumps are from the cornstarch in the sugar). Save 1/2 lb. of the sugar to work in later. Divide mixture into three equal parts and place each in a smaller mixing bowl. This allows you to make three different flavored candies at a time. Using part of the additional sugar, add enough to make the mixture into a dough. Sprinkle a cutting board or other hard surface with sugar like you do flour when making a pie crust. Add the peanut butter and some extra sugar. Then knead like you would yeast bread dough until smooth, adding just enough sugar to prevent stickiness. When the peanut butter is evenly incorporated and dough is no longer sticky, form into a large ball. Cover with plastic wrap and let set 20-30 minutes. Pinch off 24 equal size pieces of dough and roll into candy balls. They will be about 1 inch in diameter. Place on a flat hard surface lined with freezer paper (glossy side up) or plastic wrap to prevent sticking. Let dry out a couple of hours before dipping into chocolate coating. Mix the ingredients including the coconut flavoring as in above recipe. Shape into 24 equal sized balls and set aside to rest. Mix together per the other candies. Shape into 24 equal balls and flatten with fingers or a glass dipped in the sugar. Set aside to dry out and firm up. Dip candies in a Chocolate Coating. You will need 8 oz. chocolate for each one third candy recipe above. Delicious, cooked peppermints, made from scratch like Grandma used to make.